Thai Public Messaging Culture. 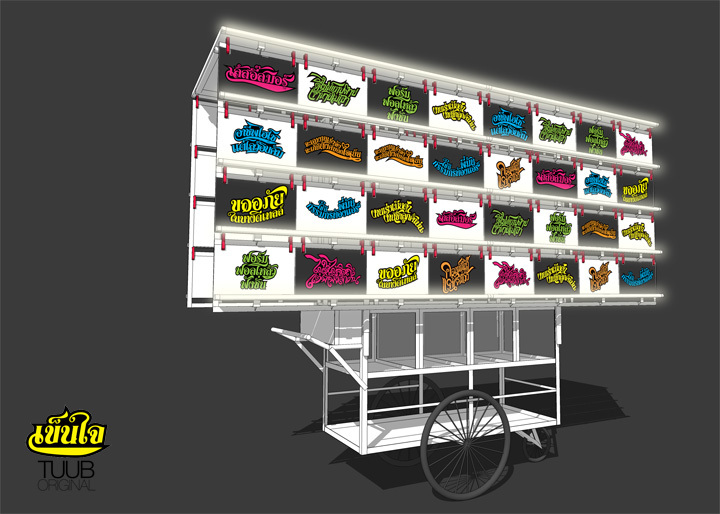 – architectkidd co. ltd.
November 19, 2010: Message Kart 2010 will be on display for the upcoming Bangkok Design Festival and Big Mountain Music Festival. Coordinated by Pitupong Chaowakul of Supermachine, with contributions from Pok Kobkongsanti of T.R.O.P. and many other of our design friends and colleagues in Bangkok, this project is a kind of a low-tech response to the messaging culture that is now common in the public and digital domain. 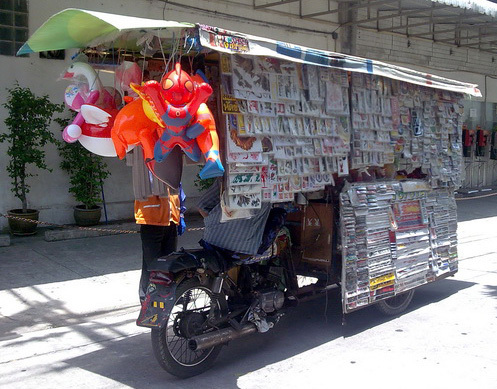 In Thailand, people have been sticking messages on to objects, vehicles and other everyday possessions for as long as these things have existed. The messages – commonly seen on city streets, taxis, and trucks – are often cheerful and are expressed in colorful styles and language. Message Kart 2010 aims to mimic this particular type of public messaging culture. Despite being typecast as being “cool”, designers are actually not much different than those driving taxis, trucks or other working-class professions. In this case, 10 architect, landscape architect and design teams have decided to gather together to create messages from their own unique perspectives. The venue for displaying the messages – a mobile vendor kart – was chosen for its directness and accessibility, with minimal design intervention. Now people can visit and buy these message t-shirt and stickers and proudly display them. For more info on all the different t-shirt messages and where to get them, please visit Supermachine’s website here. New Directions in Thai Materials.